In the world of window coverings, roman shades truly are the king of the castle. I always smirk a little when I see a customer interested in these shades, and it's hilarious to watch their eyebrows jump when I reveal the pricing to them. A shade that measures 4' by 4' can easily run you $350 (and that's just for one shade!). Unless you're rolling in cash, roman shades need to be strategically placed in areas that can afford a soft look, and in rooms that can use a good amount of light. 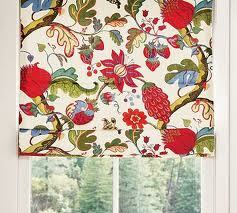 In anatomy, a roman shade is a fabric piece with loops sewn onto the back of the shade. Cords are passed through these loops in such a way, that when pulled, the fabric will ascend, cascading in 6-9" pleats. Roman shades are versatile, in that they act like a shade to control light, but also hold the same decorative properties of a valance or drapes. Romans come in two styles: flat and hobbled. When released, a flat roman is falls flat in appearance, while a hobbled roman maintains a rounded, tear-drop shape at all times. Roman shades are one of the most common blinds for someone to DIY at home. There are many (and I mean many) tutorials on how to make one yourself (try running a Google search to check 'em out). If the look works in your room- and I think they fit into almost any setting- try it out! When fashioned out of bold-patterned fabric, these shades can pack a punch and can inject instant color. Consider using a similar fabric for these shades as for throw pillows to carry a sense of continuity in the room's decor. Try a DIY shade to inject some pattern and bold colors into your decor! I only see the trend of roman shades rising over the coming years. 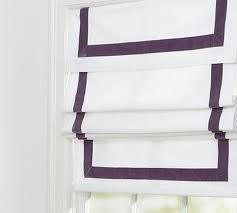 Already, I have noticed a massive shift in the willingness of the consumer to pay the lofty prices of these blinds just to have them in their homes. Roman shades essentially can also act as a status symbol, and they show the high level of thoughtfulness put into a room's details.